DOMINICK STREET will come alive to the sound of music, song, and dancing for The West End Street Party, which starts today, and features shows from the Booka Brass Band, Hermitage Green, the Ignite Gospel Choir, as well as the open air Silent Disco. The party is a 'Galway's West End presents...' event. The schedule is The Booka Brass Band (tonight from 9pm ); Hermitage Green (tomorrow, 9pm ), Ignite Gospel Choir (Saturday, 8.30pm ), and the Silent Disco Street Party (Sunday, 8.30pm ). 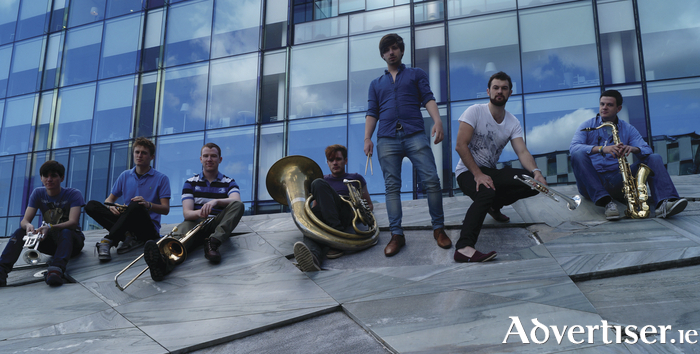 The Booka Brass Band, Ireland’s first New Orleans style brass band, have “every right to be claimed as Ireland’s best live act right now,” according to Golden Plec. Featuring members from Cork, Belfast, and other points in between, the BBB features two trumpeters, two trombonists, a saxophonist, a sousaphonist, and a drummer. Classically trained, their music also displays a great understanding of classical harmony. Formed in 2012, they have played the Galway International Arts Festival, Glastonbury, and Electric Picnic; support the Hot 8 Brass Band and the Hypnotic Brass Ensemble; collaborated with James Vincent McMorrow, Lisa Hannigan, and Paul Noonan; and win critical acclaim, with In Dublin praising their "high energy self-penned tunes combined with quite incredible covers.” This year also saw the release of their debut EP BBB, available through Bandcamp, which features a cover of Beyoncé’s ‘Crazy In Love’ with singer Hannah Grace. Hermitage Green formed in July 2010 after a jam session between friends. Within two years they were touring Ireland, Britain, the Continent, and Australia; they released their debut EP, The Gathering, which entered the iTunes chart at No 1; and followed this with tours of the Middle East, South Africa, and the US. They have since gone on to play Sydney Harbour on Australia Day and Electric Picnic. In 2013 they released their debut album Live At Whelans. The Hermitage Green sound combines hard-hitting rhythms, driven by bodhrán and djembe, rhythmic guitar lines with Dobro meolodies, and four-part vocal harmonies. The Ignite Gospel Choir was founded by Keara Sheeran, who is also the musical director. Over the past seven years, the choir has earned a reputation for its community involvement and charity work. Boasting 74 members, the choir sing gospel and sacred music as well as popular song, including hits by Eva Cassidy, Michael Jackson, and Art Garfunkel. The choir sing regularly at Mass in St. Joseph’s Church, Presentation Road.